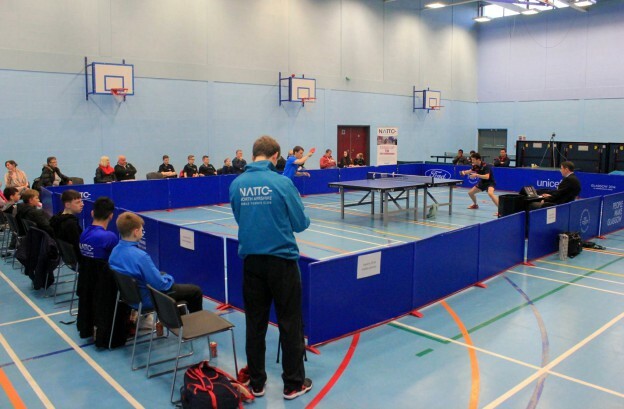 Round 5 of the British Premier League seen North Ayrshire take on London team Fusion TTC at St Matthews Academy. North Ayrshire team of Sean Doherty, Richard Main, Craig Hardie & Colin Dalgleish were up against Fusion’s Lorestas Trumpauskas, Niall Cameron, Emran Hussian & James Smith. North Ayrshire started brilliantly with Sean Doherty & Richard Main putting the home side 2-0 up, Sean beating fellow Scotsman Niall Cameron 3-0 and Richard scoring a fine 3-2 win over English no14 Trumpuaskas. Fusion started to battle back, winning 3 matches in a row, James Smith overcoming Craig 3-1, Emran Hussian beating Colin 3-0 and Trumpauskas playing great table tennis to get the better of North Ayrshire’s no1 Sean Doherty 3-1. With North Ayrshire 3-2 down, the spectators were treated to a right thriller of a match when Craig Hardie took on Niall Cameron. Craig took the first two sets 11-9, 11-9 to lead 2-0, then when Craig had 4 match points at 2-0 10-6 up, seen the rally of the day. Both players were back from the table playing forehands from all area’s of the court with Niall managed to win the rally on the 20th shot which then seen a huge change of momentum. Niall went onto save 4 match points to win the 3rd set 13-11 and the 4th 11-9. The 5th set was tight affair until Craig took the lead and won 11-8, and the match 3-2. North Ayrshire 3 – 3 Fusion with two matches to go. Richard was next up and on against Emran Hussian. Emran managed to turn the match in his favour from 1-0 8-3 down, winning the 2nd set 11-9 and the match 3-2. Final match of the day was Colin Dalgleish v James Smith, with Colin needing a win for North Ayrshire to pick up a point. Colin started the match positively winning the first 11-5, saving 2 set points in the 2nd set on his way to winning 16-14 and then securing the match with a 11-8 win in the third set. Making relatively easy work against a top ranked English junior. A successful day for North Ayrshire with good attendance in spectators numbers and a junior coaching session before the match. The final result ending in a draw for both teams was fair with North Ayrshire & Fusion happy with their performances. Another point results in North Ayrshire sitting 5th in the British Premier League table. The full match is available to watch back on North Ayrshire’s Facebook page www.facebook.com/northayrshiretabletennis. This entry was posted in Latest News on 4th January 2017 by Chris Main.